In 2010, our family experienced some big changes. We sold our house, and moved to a slightly larger one, and welcomed our third child into the family. Little baby boy L made his appearance in the summertime, and we were thrilled to have a bedroom for him when he arrived. hee hee. Unfortunately, when we moved, we had to give up our little pop-up trailer, as we no longer had room to store it at our new house. Don't worry about "old trusty," she was re-homed with my brother-in-law and his new wife. They are still enjoying the heck out of her. We were sad to give up the pop-up. Our family had used that little trailer to explore many campgrounds in California and in surrounding states. It had literally been our refuge in the storm once! And I'm almost embarrassed to type this (considering the "rustic" (aka hellacious) camping experiences I had growing up) but I just couldn't imagine going back to tent camping again. Especially with three kids. Especially having known the sweet luxury of running sink water (have I mentioned my germaphobe tendencies?) which enabled my babies to actually return to their natural color before bedtime. Especially with my little foam bed. But really, especially with the sink. I loved having that sink. Anyway, during that year, my in-laws also purchased a travel trailer. They had been asking us to go camping with them for quite some time (no, they are not insane, just very, very nice & loving grandparents). They love to camp, and have been camping for years, so we knew we'd have a great time with them. 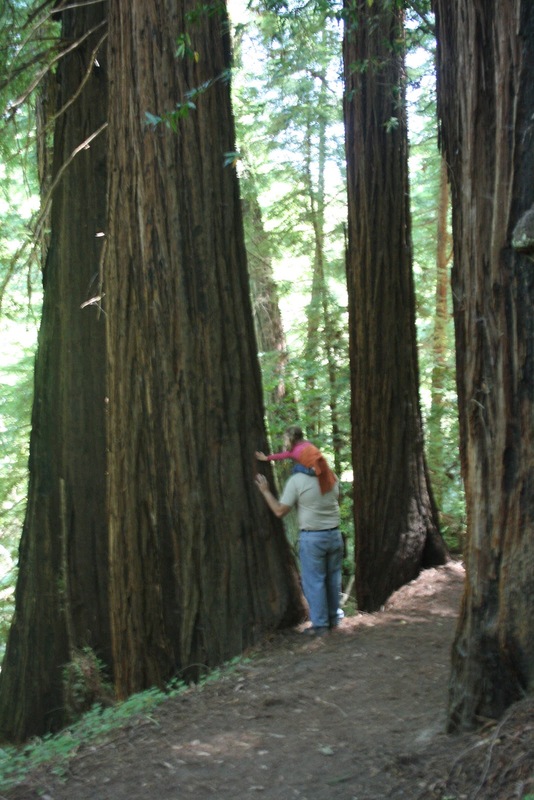 My husband recommended Big Sur, and they agreed happily. 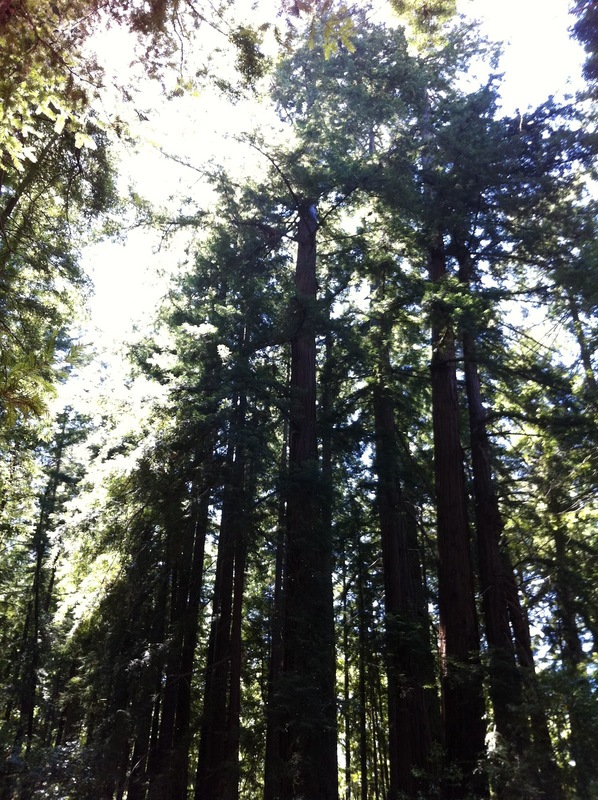 We stayed at Pfeiffer Big Sur State Park and it was absolutely amazing! We drove up the coast on Highway 1 and were treated to spectacular views of crashing waves, soaring condors, and dolphins leaping in the surf. The road was very curvy and rather steep as you approach Big Sur, so if you are prone to carsickness, this is not for you. However, we loved every second of it. Here are some shots from the road. Mind you, these photos were taken from a moving vehicle (don't worry, I wasn't driving) and they were still pretty. Imagine if you didn't have three car-hating kids and you could actually pull off and enjoy the scenery....ahhhh...now back to my reality. Bixby Bridge--very cool (just north of Big Sur). Very scenic ocean views along the drive. Keep your eyes peeled. You can easily see dolphins (we saw a whale spouting on our last trip!) seals, or other sea life while you ride. Beautiful rugged grasslands. There were lots of cattle grazing. Now these truly looked like Happy Cows! Another shot of Bixby Bridge after we passed over it. It was pretty foggy in the morning, but it burned off by mid-day. This was our (shared) home for a week. Four adults, two toddlers, and a baby in this puppy...and we were all still on good terms when we got home a week later. Miraculous! We drove into the campground, and it was like we entered another world. 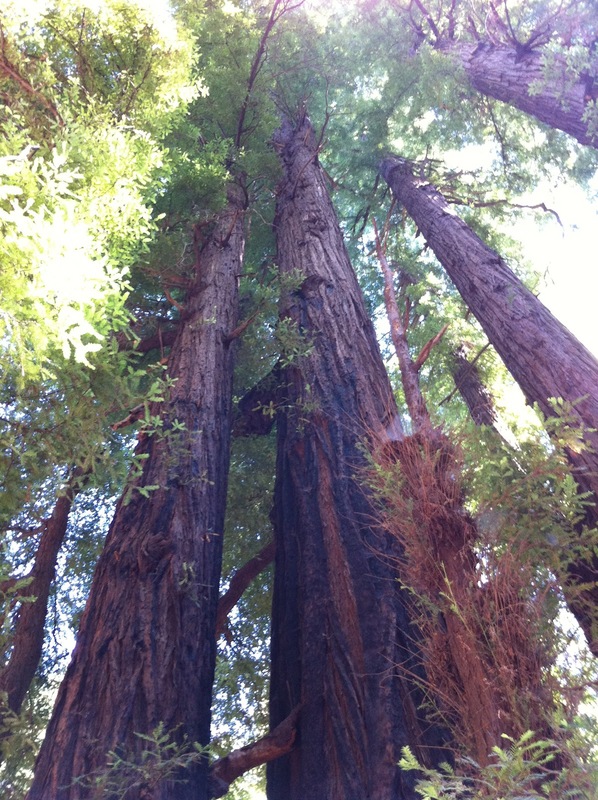 The most beautiful Redwoods greeted us, towering overhead, their rust-red bark was warm and welcoming. 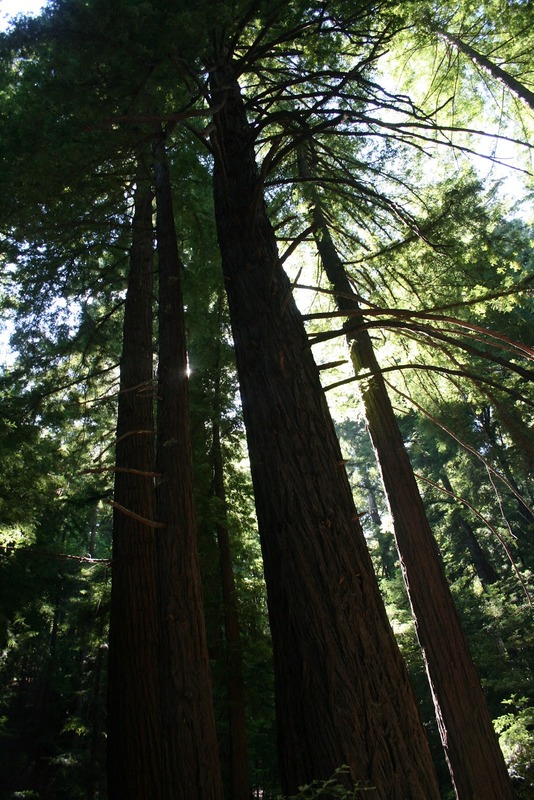 Sunlight filtered through the huge canopies so high above us. It was like a mystical, magical happy place. I was in love immediately. How could you possibly get tired of looking at them? What's that? Oh. You are tired of tree pictures? Sorry. Last one, I promise. 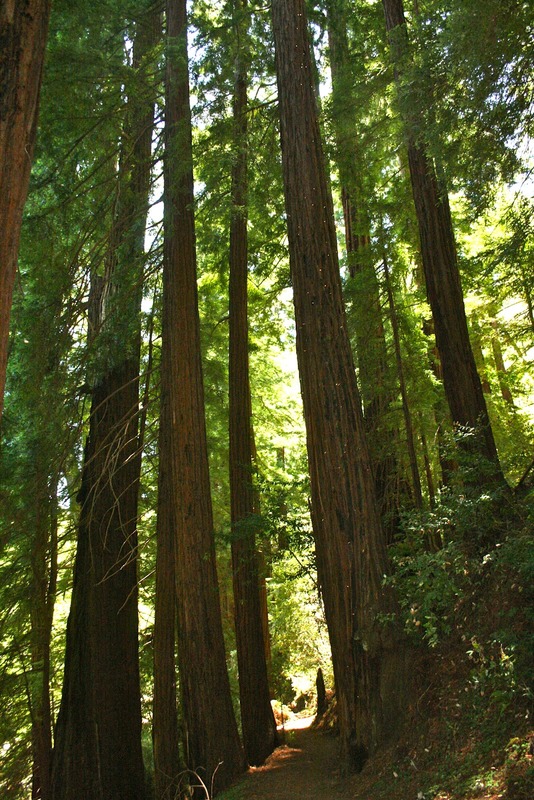 There are two very distinct different types of campsites in Pfeiffer Big Sur State Park. There are spaces within the Redwood forest itself which are darker, and woodsy-er (yeah, it's a word) and there are spaces on the river which are sunnier and outside of the forest. There are pros and cons to both, just depends on your preference. I love the woods sites. 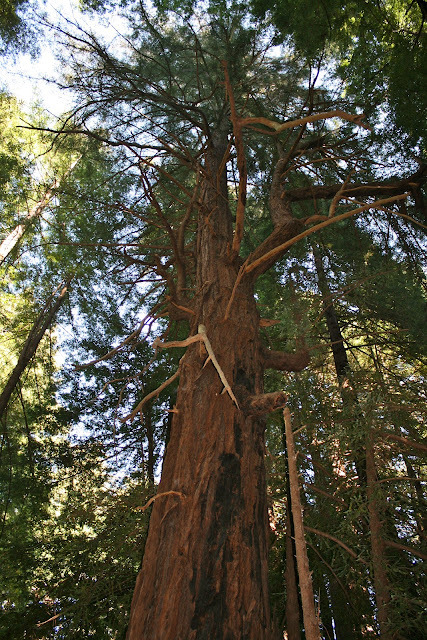 I like to be within the forest, looking up at the redwoods. However, the river sites were EXTREMELY popular, especially during the warmer months. Many campers were wading, swimming, playing in the water and they seemed to love the sites that backed the water. The sound of the rushing river was amazing near these sites. One negative to this campground (I try to share everything with you--pros & cons) is the poison oak all.over.the.park. It was crazy how much was growing everywhere. This was very nerve-wracking to us with a very curious little baby boy. We had to keep him (and his sisters) very close to us to prevent them from touching any plants. One tip: even if you're in an rv, bring a little tent. It will give the kids a place to play (poison oak free) while you are cooking, setting up camp, etc. It was really helpful to us with small children. Make sure you bring some poison oak remedy, just in case. There is a little camp store (open during certain seasons) and laundry facilities if you need them. We did laundry once on this trip, and there was no waiting for a machine, despite the campground being full to capacity. There is free wi-fi available at this store/laundry area, but we found cell phone reception was very limited within the park. Another thing to be aware of is that spaces (especially those within the forest areas) are rather tight. Our site said it could accommodate trailers up to 27 feet. Ours was 18, and I don't know how the heck my hubby got it in the space. Seriously. There were inches on either side. Then he had to maneuver a full-sized Suburban in front of the trailer so we'd be fully in our spot. A trailer next to us was not going to fit in their spot. No way. He ended up trading with a very generous camper next to him who was arriving at the same time and had a larger site. Okay, back to the fun stuff. There are several amazing hikes right inside the park. 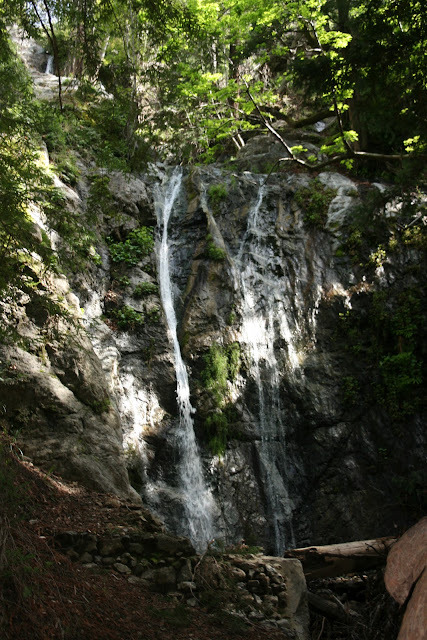 I highly recommend the hike to Pfeiffer Falls. It was beautiful. And at 2.4 miles, even our young kids (3 & 6) could walk the whole way. Pfeiffer Falls. Well worth the hike for us! 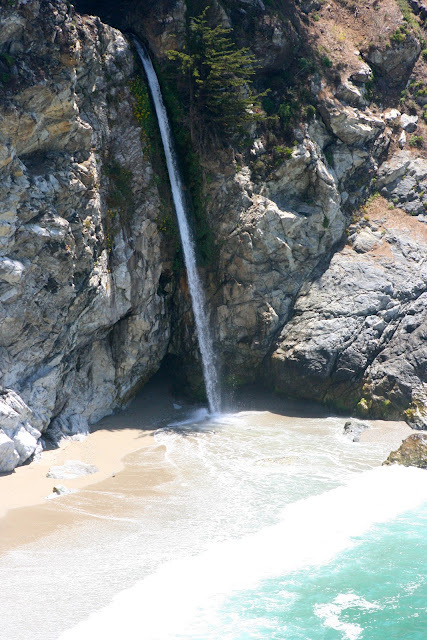 Just a short drive away, The hike (more like pathway) to McWay Falls is also very amazing. This walk is extremely short (less than 1 mile) and just a simple walk to see breathtaking waterfall which flows onto the beach. I mean c'mon, is this place paradise, or what?! 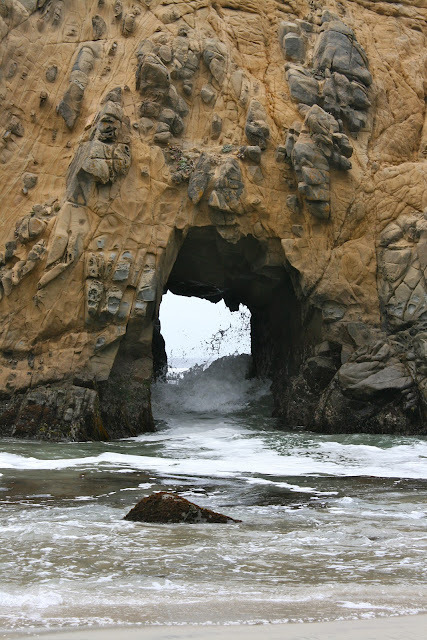 We also drove to Pfeiffer Beach to explore one day. It was a gorgeous setting...large rock outcroppings, with caves carved into them, waves crashing onto the shore and agains the rocks. Big Sur (and Pfeiffer Beach) have un-spoiled natural beauty that you just don't see very often anymore. Especially in California. One reason it remains un-spoiled, is that it's so difficult to get to. :) It's on a small, un-maintained road which doesn't allow RV's on it at all. The clearance is rather limited (low hanging trees) and at times you will need to yield to on-coming cars. But if you are able to make it, you won't be sorry! We had such a spectacular time in Big Sur, that my husband and I both agree it was one of the deciding factors which led up to the purchase of our current r.v. We had wanted one for years, and had actually been "shopping around"and researching them since before our oldest was born (6 years prior). We just were never really fully prepared to commit, or certain that we'd really enjoy it enough to make the purchase until now. Big Sur is Big Pretty pretty! WOW, ok- you are a really good photographer! What's your secret? Those trees.. yep I am scrolling back up to check them out because those are awesome! !